Today is a day that I have been waiting for...well what seems like forever. 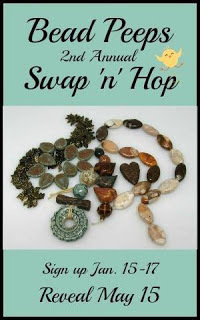 It's the reveal for the second annual Swap-N-Hop. Just a reminder of how it works. Two jewelers are matched up and we send each other beads to work on. My partner this year is Kristina Peck and she sent me a delightful selection of beads to work with. Hard to believe that this is her first swap. I just love that polymer leaf. Also included were some gorgeous jasper, Czech glass and glass pearls. 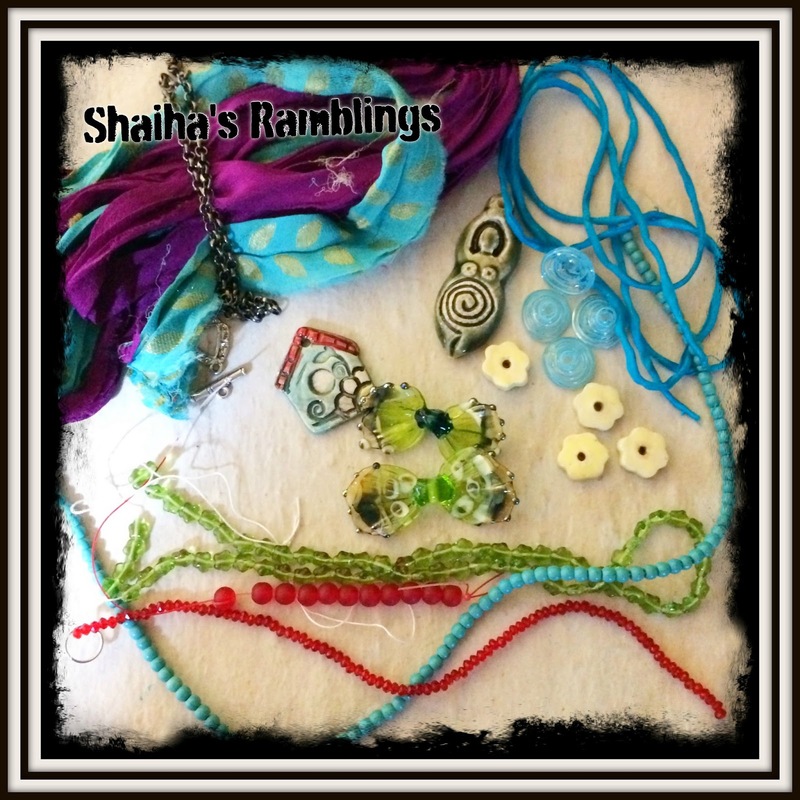 And here is the assortment that I sent her way. I can hardly wait so see what she came up with as there are several different directions to go. And now it is time for my big reveal. The leaf focal that I received was rather large so I decided to make it a longer necklace. I wirewrapped up the jasper along with the Czech glass and added in some snakeskin jasper and pewter links. It is finished off with a lovely pewter leaf clasp. 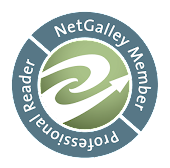 Now that you have had a chance to check out my design, be sure to hop around to check out all the eye candy. And since it has been traditional for me to give away something on this type of hop,I will be giving away this lovely primitive horse necklace. Be sure to leave a comment about what you think of my design. Or how your weekend has been going. Or the funniest thing your pet has done. Oh well, you get the idea. Now go forth and hop. Hate to trouble you but I think you only posted one picture, the other may not belong to this swap I'm not sure though. I would love to see the necklace you made in it's entirety. I love your work so I am sure that the design was amazing! I am so glad that you commented. Yep I forgot a pic. The leaf is really stunning as is your necklace with it. 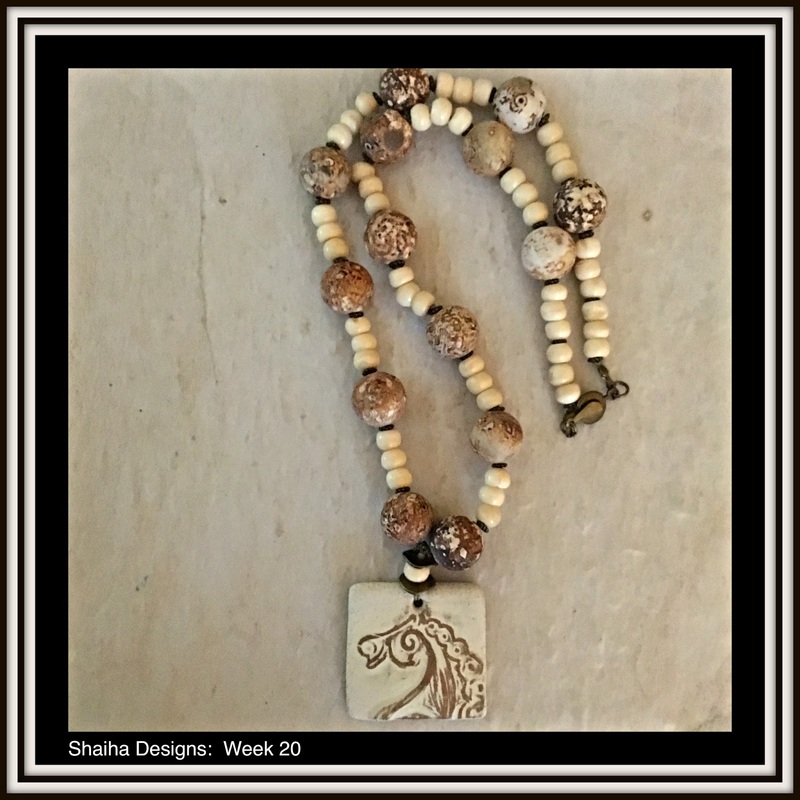 The primitive horse necklace has a southwest desert look to it. 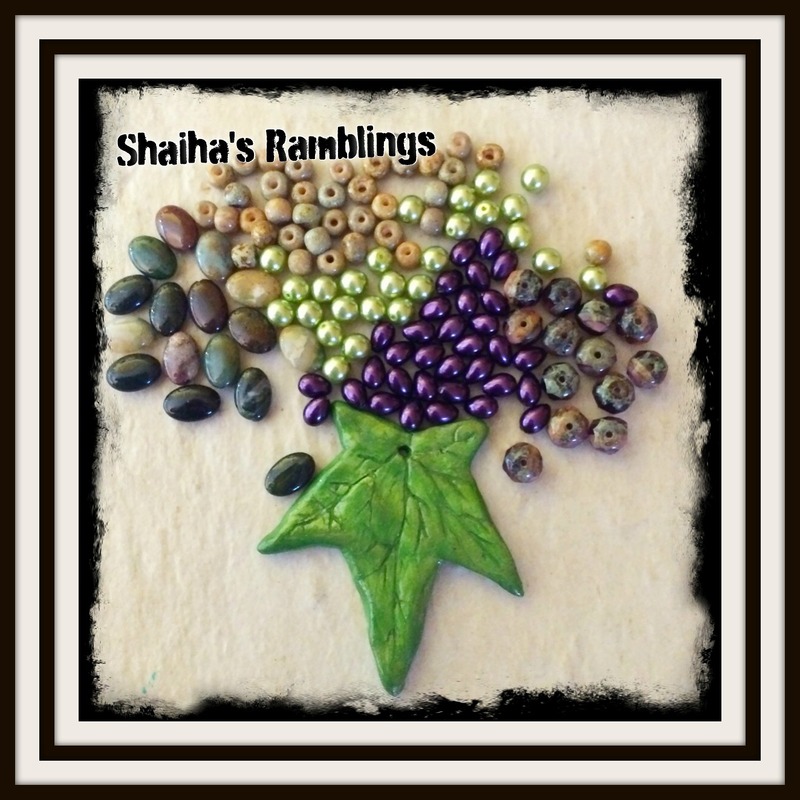 The beads are a perfect color and texture to go with the pendant. What a great piece! I am surprised you are giving it away. It looks like a keeper to me! You found a great way to incorporate that big focal into a lovely, delicate piece -- the wirework made it feel airy and completely wearable. It looks appropriate to wear both spring and fall - what a versatile and eye-catching necklace! I LOVE that necklace!!! I love all the jasper and I love the way you put it together!!! This is REALLY Beautiful!!! The horse necklace is very earthy and I love the beads and the Focal. Thank you for the opportunity to win it! Love how you wire wrapped the jasper. I especially like the leaf in the design. Hi Shai, you showcased that polymer leaf beautifully. I really like the wire wrapped beads on your necklace, you added a lot of texture but kept it light and airy. Very pretty! Beautiful! Love the necklace with the leaf focal especially. Great wirework.. love the green leaf & delicate feel of the piece. WOWSERS! Shai you KILLED it! I'd have been so lost as to what to do with that big leaf, but you nailed it! I always forget to put something interesting in between hand wrapped links - so thanks for the reminder. =) Those jump rings REALLY add texture and personality. BEAUTIFUL job! 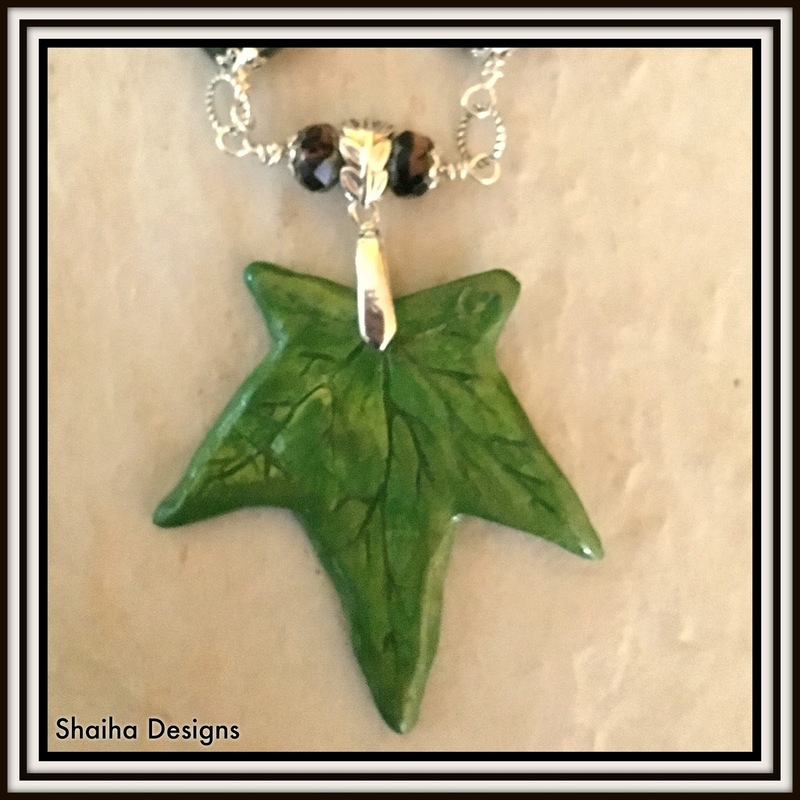 I love the leaf themed necklace! I'm glad you enjoyed the beads and I love what you made. Thanks for being my partner. Such a stunning necklace Shai! I can see it in a "Chi Chi" boutique on Rodeo Drive! By the way since the move Princess Emerald has been sitting in her Princess tower looking out at all her new bird subjects and admiring the foliage that is coming in which reminds me of the leaf motif of your piece! Love the silver mixed with the leaf pendant! Awesome piece! I love how the silver and the green really marry well. Well done! WOW! as usual a gorgeous piece Shai! You know I love you work and this is no exception...really stunning and I love your choice to pair the greens with silver. Beautiful necklace with that leaf focal! I love the polymer leaf. It's one of my favorite things to make with polymer and one of the first things I got to turn out right! You made such a light and lacy necklace with it, truly stunning! That horse focal is wonderful too! I love the colors and the arrangement of the wire wrapped links with the large focal! Beautiful work! I love the way you wire wrapped the squares, it's a beautiful necklace and I love the focal. On your giveaway piece, I really love that focal, and you did a wonderful job with it. Love both pieces. Love the necklace with the leaf. I loved how you did the wire wrapping. 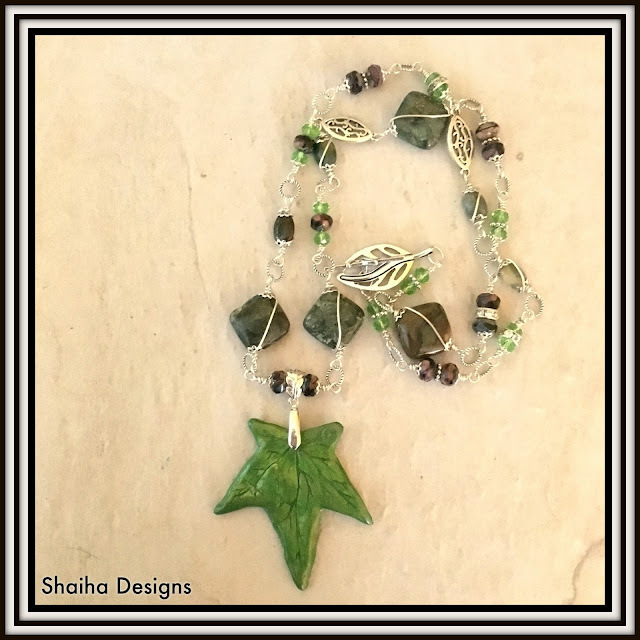 Love how you wire wrapped the jasper and the way you used the little bar of beads to hang the leaf focal. Beautiful pieces for full of light.